Moon takes place sometime in the near future, where scientists have discovered an alternative energy resource harvested from the Moon. Astronaut Sam Bell is an employee for Lunar Industries stationed on a lunar base to extract this resource and send it back to Earth. He is almost at the end of his three year contract, having spent the past three years without human contact, and only his robot Gerty as a companion. Moon is very much an intelligent sci-fi story about the moral consequences and dilemmas of a “What If” situation. It moves pretty slow, and harks back to those sci-fi movies of old, like 2001: A Space Odyssey and Outland. If you’re still in need for a present for someone and that person likes intelligent movies (being a sci-fi fan is not a must), get this movie. It’s a brilliant, low-budget movie with stunning effects and an interesting plot. 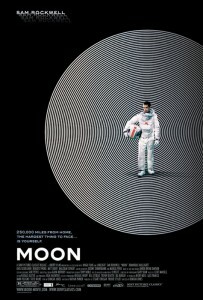 And again thanks to Zavvi.com, I’ve got one DVD to giveaway of Moon! To enter the competition, leave a comment behind on this post with your favourite sci-fi movie. You’ve got until Sunday 27th 18:00 (UK) to enter. Again sorry to disappoint, but this competition is only open to those based in the UK. For those of you overseas, keep an eye on the blog tomorrow, there will be a giveaway open for everyone!